Hello! It's Karla back today with another blog post featuring the amazing Scrap Shotz December Kit and some of the fabulous kit add-on's again, and today I've created a 12x12 layout as well as a pocket page layout for you! Living in Canada, we get a lot of cold weather in the winter, so we might as well make the best of it and get out to do activities while we can. This kit, which includes lots of awesome elements from the Carta Bella Cabin Fever collection, is so perfect for all those winter pics!! I used the pretty Thickers from the kit, which have a shiny coating on them, on the bottom of the layout. They are such a great size to make a nice big title! I layered the papers on a piece of ivory cardstock from my stash and used some of the beautiful shiny snowflake paper which comes in the kit. I love the pretty brads and enamel dots layered over the ephemera along with some of the 'add-on' rub-ons and enamel phrases. The pretty enamel snowflakes that come in the kit are so pretty layered over papers and photos - I love the clear backing! When I have extra photos I really like putting them into a pocket page! I cut apart the patterned paper with the 4x6 cards on it and used this pretty sweater pattern to layer on a couple pieces from the ephemera pack, a piece of the shiny snowflake paper and a photo cut to 2x2. I cut the brown cardstock, included in the kit, to fit in the 4x6 pocket and added a 3x4 photo, rub-ons from the add-ons, a piece from the ephemera and some enamel dots. A white gel pen showed up nicely to add some journaling. I used some of the cut apart 3x4 cards in the pockets and even added some of the patterned papers cut to size to create my own journaling cards. The stickers from the sticker sheet are perfect to layer on, and the neat Bundle Up sticker from the enamel phrases pack, which is an add-on, added a nice detail to my photo. The cut apart sheet has such great printed journaling cards that you can simply tuck them into pockets without even adding anything else and they look great! Thanks so much for stopping by! 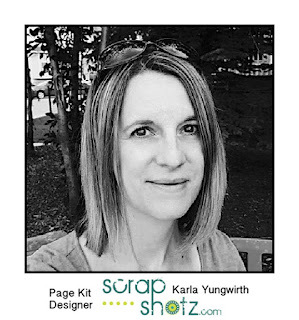 To subscribe to the Scrap Shotz kit club, you can check out this month's kit at the store, and the coordinating add-on's can be found here by scrolling down to the December 2017 section. I hope you have a warm and cozy week ahead, and have lots of fun creating! !